I've baked this cake at least a dozen times & always get rave reviews. 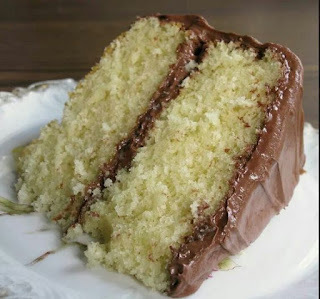 The cake is very moist with great flavor. It tastes even better the next day! I use Baker's Joy spray to prep Bundt (non-stick or regular) & NEVER have problems with cake breaking up when inverted. I usually cool the cake 40-45 min. at most. Sometimes butter/shortening & flour combo used to prep pans can be a problem when the cake cools completely. This "paste" is almost like a glue when it completely cools. For round cake pans, you can heat pan bottom for 5-10 seconds on stove eye (electic or gas) & it will release when the butter or shortening melts slightly. This is difficult for Bundt pans. I'm huge fan of Baker's Joy spray-it always works! Also, the chopstick idea is awesome. After the cake has cooled for 5 min, I poke 30-35 holes in the cake all the way to the bottom of the Bundt pan with the smaller, tapered end of the chopstick. Then I spoon or pour on the butter sauce (I make 1 1/2 times the sauce recipe). Adding 1/2 to 1 tsp cinnamon is a great variation. Also, I recommend creaming the butter & sugar for 5 min then creaming another 5 min after adding eggs/vanilla. Then I alternate dry ingredients with buttermilk. The cake rises like a charm (you can use a 12 cup Bundt pan). What a cake!! !